College Club provides a vibrant environment for those preparing for, or already in, higher education. Full-time advisors work with students to equip them with the skills and knowledge needed to attend a higher educational institution through workshops, assistance in completing admissions applications and finding scholarships. We offer academic, financial and health workshops, help with paperwork filing, sourcing scholarships and organizing trips to college campuses. By familiarizing students with campuses throughout California, we hope to broaden their options and support their highest aspirations. There are five PSHH College Club sites: Canyon Creek (Paso Robles), Los Adobes de Maria I & II (Santa Maria), Mariposa Townhomes (Orcutt) and Riverview Townhomes (Guadalupe). Currently, our College Club supports approximately 150 members, all of whom are either former PSHH after school students and/or after school program volunteers. Support college dreams today! College Signing Day observes the importance of reaching past a high school education. It celebrates those who have chosen to continue their academic journey, and provides an opportunity for the community to collectively applaud their decision. In May, People's Self Help Housing will host two College Signing Day events for college-bound students. These evening receptions will be full of inspiration, pride and encouragement while providing an opportunity to enjoy the food and hospitality of the neighborhood. If you are interested in participating in this year's College Signing Day, please email education@pshhc.org. Currently 300 students receive services through our highly academic, on-site program. 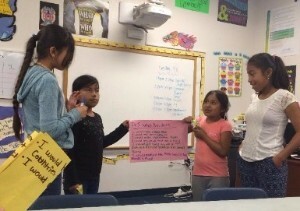 The after-school program, also known as “La Escuelita” to our residents, at 10 sites, offers homework tutoring, support for parents through school engagement, enrichment programs, summer camps, intensive literacy programs and individual learning plans. Educators maintain contact with parents and teacher through daily interaction on site and through parent teacher conferences and email with teachers at each student’s school. The program offers all of these services at home in our on-site learning centers. Educators and parents become partners in the child’s education. This creates a community of learners. The statistics for our first cohort of students Kinder-8th grade (students we have followed for 10 years) show a 100% high school graduation rate and zero teen pregnancies. Students are working full-time (11), going to community college (18), or still attending high school (18). Support youth education today! The Youth Literacy Program serves 250 resident students Kinder-12th grade at nine of our properties. 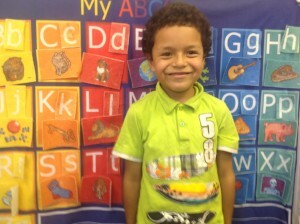 Four days a week for 45 minutes students work independently, and with an educator, to improve grade level reading. 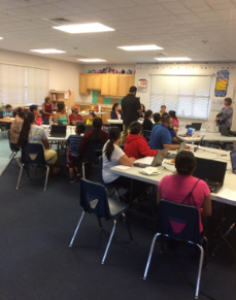 Students use a web-based program, Reading Plus, and are also offered one-on-one tutoring. Educators monitor students’ progress weekly and share findings with students, parents and teachers. In the 2015-2016 academic year 59 students participating in YLP went from 9% reading at grade level to 87% reading at or above grade level. The goal of the program is to continue to see these results every year and to have grade level readers continue to improve reading until they reach college grade level reading. This academic year, 2016-2017, 73% of new resident students in YLP are reading at or above grade level. This data was collected after only six months in the program. Support literacy today! Peoples’ Self-Help Housing, United Way and EconAlliance have designed the WNI, a broad-based collective impact collaboration, with ten regional partners, who provide literacy, workforce, STEM and life skills programs that target six low-income neighborhoods (five of which are Peoples’ Self-Help Housing Communities). Support strong neighborhoods today! United Way NSBC, EconAlliance, Santa Barbara Country Resource & Referral, Allan Hancock College, Central Coast Literacy Council, Women’s Economic Ventures, Academic Scholar, Lompoc Co-Op, and AmeriCorps. STARTSmart- onsite childcare provider licensing, business planning with ongoing parent support. READSmart- onsite adult English language acquisition, adult literacy. STEMSmart- onsite after-school robotics, 4th-8th grade and high school, Summer College Camp at Allan Hancock College and STEM Action Camp, onsite and at various employer locations. WORKSmart- workforce readiness for neighborhood residents featuring onsite workshops on regional Industry & Career Awareness, regional Career & Education Resources, Employment Search, successful Applications and Job Interviewing. WORKSmart includes Job & Career assessments for adults engaged in WNI literacy program. PROSPERITY! Features Financial Literacy, Entrepreneurship, and Co-Op Business Ownership workshops. The Adult Literacy and Workforce Readiness Program (ALWRP) is a collaborative effort with United Way of Northern Santa Barbara and EconAlliance. ALWRP serves 100+ affordable housing residents from families of low and extremely low income, some of whom reside in rural areas, all of whom can be classified as under served. ALWRP addresses reading literacy for adults, as well as financial literacy, career awareness, job readiness and orientation to entrepreneurship. We focus on efforts to strengthen the positive impact made in community by reaching into currently under-served communities and collaborating with other organizations and stakeholders to deliver new and innovative services. As part of this project, Peoples’ Self-Help Housing provides literacy through the Power Readers program to all program participants by having Peoples’ Self-Help Housing classroom, staff and computer labs available M-Th, four hours a day. United Way provides Power Readers software licenses and Power Readers training and program support services. EconAlliance provides financial literacy workshops, coordinating with PSHH to attract participant attendance by adults and teens. EconAlliance organizes career awareness forums featuring career opportunities/skill needs in regional industries, as well as introduction to workforce training resources and entrepreneurship possibilities in the community, and beyond and job application/interview training. Support literacy today! 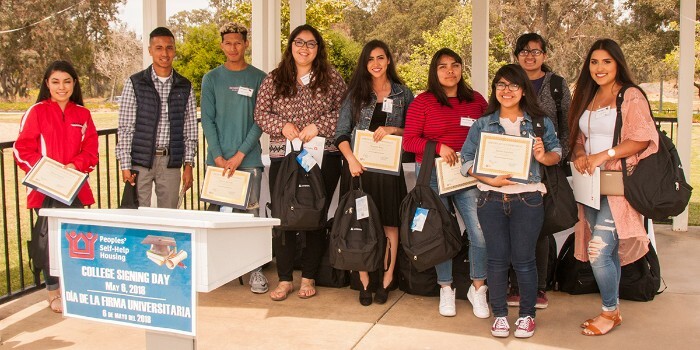 Peoples’ Self-Help Housing, Central Coast Literacy, Family Resource and Referral, EconAlliance and United Way have joined forces to provide economic opportunities to stay-at-home parents who currently provide daycare to other residents. 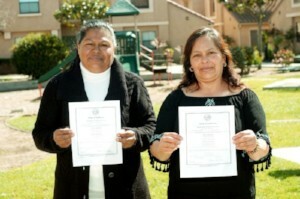 The collaboration provides literacy, financial literacy, entrepreneurship training and in-home day care licensing to residents from our Los Adobes de Maria I and II farmworker apartments in Santa Maria. Of the 110 units of farm workers and their families, 20 children are presently under the school age of five years old. As licensed daycare providers, residents can increase their income from $10/day per child to $35/day per child. They will be earning over three times as much as they earn now. Residents will also be able to manage their “new” business with the skills they learn from our partnering agencies. This is a pilot program that we hope to expand as part of our Working Neighborhoods Initiative. Support the entrepreneurial spirit today!